*Departure as per client’s convenient dates possible for groups of 4 or more. From the grasslands of Kaziranga National Park, to the foothills of the Himalayas at Nameri, to the Eastern Himalayas in Eagles Nest, you will have an opportunity to view rare birds that are endemic to this region. GETTING THERE AND AWAY: The trip starts and ends at Guwahati, capital of the state of Assam in the North-East region of India. Guwahati is connected to major metros of India by flight, and by rail. Hoolock Gibbon are some of the endangered mammals which are guaranteed in the national park. The tiger is also a possibility. dining room which serves outstanding food. 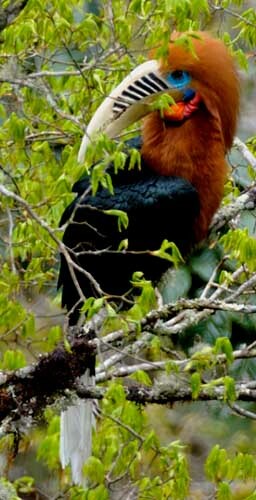 Nameri and Kaziranga share some birds but many forest birds are more easily seen in the mature evergreen forests of Nameri. Cochoa, Pied Falconet and Chestnut-winged Cuckoo around the camp site. Nameri is one of the best sites for the White-winged Duck, our principal target there. The roosting sites of Great and Wreathed Hornbills provide an awesome spectacle of dozens of these birds settling in for the night. Large-tailed and Savannah) may be observed at dusk. Day 4, 5, 6,7 : On the way up to Eaglenest on Day 4 (and on a subsequent downward excursion) we will stop at various locations up to 1000m to pick up the foothill specialties and reach the camp site inside Eaglenest by dusk. The use of jeeps provides us with a great deal of flexibility in choosing the altitudinal range to bird on any given day, depending on the weather, the degree of success on previous days and priorities of the visitors. Full list of birds that are targeted is below. Day 8: After breakfast drive from Eagles nest to Nameri (2 hours). Take a stop and do some gentle river rafting. Late afternoon drive back to Guwahati and check into your guest house. water baths, spacious walk-in tents with cots bearing warm mattresses, blankets, sleeping bags and hot water bottles (! ).The toilet complex comes with bath cubicles, Western- and Indian-style lavatories, water tanks and improvised wash-basins – all portable to ensure that no visible trace at the end of the tour. The facilities are deliberately kept at a basic level to reduce our footprint in the wilderness, but without ignoring any of the essentials which detract from a full birding experience.